From 3 Star Studio, the clever designers who brought us the awesome ARC Dollhouse, comes a brand new dollhouse that offers double the fun. The REVERSIBLE ROWHOUSE is a 1:12 scale dollhouse, designed for play, display and constant fun, and it’s the world’s first-ever reversible dollhouse. As two dollhouses in one, your child can play and decorate the house on one side, then flip the entire house over to reveal a different layout. The floors and ceilings can be painted different colors, and once you flip the house it will change the entire look and feel. 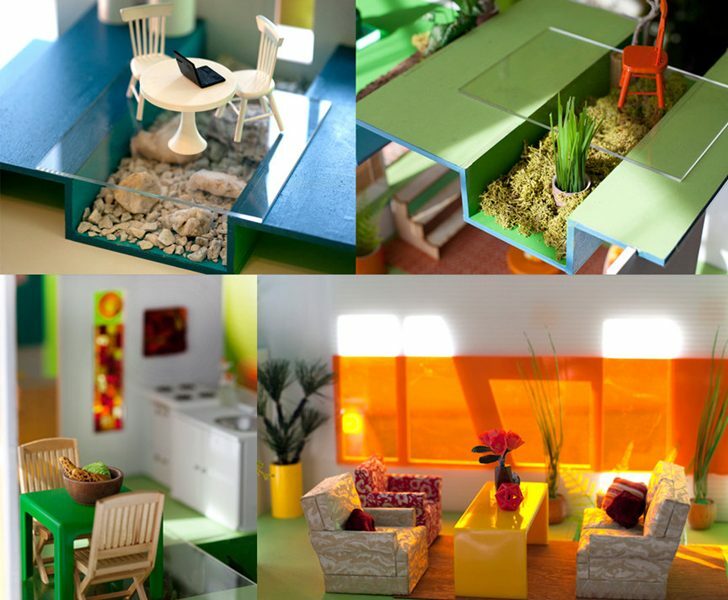 Awesome extra features of this modern dollhouse include sunken and raised areas on the floors and roofs, plenty of play space to fill with furniture and dolls, plus easy assembly. This dollhouse is laser cut in the USA from sustainable Baltic birch plywood and makes the perfect eco-friendly gift for any child or adult dollhouse enthusiast. From 3 Star Studio,�the clever designers who brought us the awesome ARC Dollhouse, comes a brand new dollhouse that offers double the fun. The�REVERSIBLE ROWHOUSE is a�1:12 scale dollhouse, designed for play, display and constant fun, and it's the world's first-ever reversible dollhouse. As two dollhouses in one, your child�can play and decorate the house�on one side, then flip the entire house over to reveal a different layout. The floors�and�ceilings can be painted different colors, and once you�flip the house it will change the entire look and feel. Awesome extra features of this modern dollhouse include�sunken and raised areas on the floors�and�roofs, plenty of play space to fill with furniture and dolls, plus easy assembly.�This�dollhouse is laser cut in the USA from sustainable Baltic birch plywood and makes the perfect eco-friendly gift for any child or adult dollhouse enthusiast.